Billy Hitchcock spent over forty years in professional baseball as a player, manager, scout, coach, and minor league executive. For nine seasons between 1942 and 1953, he was a utility infielder with five major league clubs. He had stints as manager of Detroit, Baltimore and Atlanta in the 1960s. During the decade of the1970s he served as the highly respected president of the Southern League. Born William Clyde Hitchcock on July 31, 1916, in Inverness, Alabama, he was the son of James Franklin Hitchcock, clerk of the circuit court of Bullock County, Alabama, and Sallie Louise Davis. The family of five boys and two girls included an older brother, James, Jr., an All-American football player who played briefly in the majors. Billy starred in two sports at Alabama Polytechnic Institute (now Auburn University). The 6’1”, 185-pound All-Southern Conference tailback led Auburn to its first bowl game, the Bacardi Bowl in Havana, where he scored Auburn’s only TD, a 40-yard run, in a 7-7 tie against Villanova. As captain and shortstop on the baseball team he led the Tigers to their first conference baseball title. In his youth Hitchcock played summer ball at Union Springs, Alabama, in the Dixie Amateur League (1933), Abbeville, Alabama (1934 and 1935), Greenville, North Carolina, in the semi-pro Coastal Plain League (1936), and a textile mill team in Langdale, Alabama (1937). After Hitchcock’s college graduation in 1938, Johnny Nee signed him for the New York Yankees. However, a knee injury sustained playing football kept him from playing until the following year. The Yankees started Hitchcock at the highest level, with Kansas City of the American Association. With Phil Rizzuto as the Blues’ shortstop in 1939 and 1940, Hitchcock moved to third base. He showed good speed, fielded cleanly, and hustled, but his .263 and .268 batting averages in 1939 and 1940 did not impress. With Vince DiMaggio (46 homers and 136 RBIs in 1939) and Rizzuto, minor league player of the year in 1940, Kansas City needed little from Hitchcock. In 1941 Hitchcock emerged as a big league prospect. A knee operation after the 1939 season improved his range, and his marriage to former Auburn co-ed Rebecca Rice of Opelika, Alabama, prior to the 1941 season gave him security. With Rizzuto’s promotion to New York, Hitchcock moved to shortstop. He batted a solid .296 with 59 RBIs and 21 stolen bases. Joe Williams reported in The Sporting News “at least six big league clubs are after him” (TSN, 9/11/1941). Detroit acquired Hitchcock from the Yankees and made the rookie their shortstop for 1942. He made his debut April 14, 1942, and that first game remained his greatest baseball thrill. Even though he hit only .211 in 1942, at 26 he seemed destined to have a long career ahead of him. Hitchcock, who was a lieutenant in the Army reserves, got the call to report for active duty in early August 1942. He served in the Army Air Force and advanced to the rank of major by the end of World War II, earning the Bronze Star for service in the Pacific and three battle stars. When Hitchcock returned to baseball in 1946, the Tigers had given their shortstop job to Eddie Lake. Hitchcock played only three games before Detroit sold him to Washington, where the great pre-war shortstop Cecil Travis had to switch to third base because of his war injuries. Hitchcock hit a disappointing .212 as the Nats shortstop. For the next three years Hitchcock settled into a utility role. Washington sold him to St. Louis, where in 1947 he hit his first home run but batted only .222. The Browns traded him to Boston with Ellis Kinder for pitcher Clem Dreisewerd and infielders Sam Dente and Bill Sommers. He contributed a tidy .298 average in the BoSox’ pennant drive in 1948, but fell back to .204 in 1949. In the early 1950s, Hitchcock logged three solid seasons with the Philadelphia Athletics. After Boston traded him for catcher Buddy Rosar, he became Connie Mack’s regular second baseman in 1950. He batted a quite respectable .273, with personal highs in doubles and triples. In 1951 he compiled a .306 average, the only year he hit over .300 in either the major or minor leagues. On September 7 he had his best day, hitting two triples and a double while driving in five runs. The following year, as the regular third baseman, his average dropped to .246, but he posted his major league high of 56 RBIs. Detroit reacquired Hitchcock in 1953 in a trade for Don Kolloway, but he played only 22 games for the Tigers, batting .211, the same as he hit for them in his rookie season twelve years earlier. The Tigers organization liked Hitchcock and believed the affable Alabaman had a future in the game. 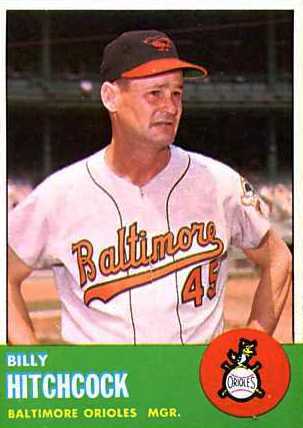 They appointed him as manager of their Triple A farm club in Buffalo (International League) for one season, 1954, and then brought him to Detroit as a coach. He stayed in that position for the next seven years under six different managers. In 1960 the Tigers and Cleveland pulled off one of the strangest deals in baseball history, trading managers. Jimmy Dykes left Detroit for Cleveland, and Joe Gordon came to the Tigers. Detroit had a game to play before Gordon could reach the club, and Hitchcock managed for one game, a Tigers victory. After seven years as a coach, Hitchcock got the opportunity in 1962 to manage in the majors. Lee MacPhail, president and general manager of the Baltimore Orioles, thought his young team would perform better for an easy-going manager than for authoritarian Paul Richards. Brooks Robinson remembered, “Billy was the nicest guy you ever wanted to meet, but we didn’t play very well under him” (Peary, 579). In fact, the 1962 Birds were awful. Their wins declined from 95 to 77. In retrospect, it is surprising Hitchcock stayed at the helm for 1963. In his second season, the Orioles got off to a good start and were in first place at the end of May, but they swooned in June, losing 22 of 30 games. The Orioles did recover enough to finish with 86 victories against 76 loses, but fans were disappointed, and Baltimore quickly replaced Hitchcock with drill-sergeant Hank Bauer. After the team added Frank Robinson and Jim Palmer, Bauer would lead the O’s to the pennant in 1966. Hitchcock’s managerial stint at Baltimore ended with a 163-161 record. His 1963 team was built around fielding and speed. They led the American League in steals and fielding average, but pitching let them down. Another chance to manage came in 1966 and 1967. After Hitchcock’s firing, MacPhail kept him on as field coordinator and scout for the Orioles. Then John McHale hired him as scout for the Milwaukee Braves in 1965. When the team moved to Atlanta in 1966, Billy became a coach under fellow Alabaman Bobby Bragan. After winning 84-88 games the three previous seasons, the Braves slumped in Atlanta. Following a 52-59 start under Bragan, McHale handed the reigns to Hitchcock. His mild-mannered approach seemed to pay off, as the Braves suddenly became the hottest team in the league, finishing with a 33-18 record under Hitchcock. Hank Aaron’s 44 home runs and 127 RBIs helped. The high expectations engendered by the strong finish in 1966 could not be met in 1967. The club fell to seventh with a 77-85 record. The season resembled the 1963 season in Baltimore in that the Braves played well the first half of the season, only 3.5 games back on July 22. Then they nose-dived, finishing 24.5 games behind the league leader. Hitchcock’s managing style differed sharply from his approach at Baltimore. The Braves, old and slow, relied on an offense that played for one base at a time. They led the NL in home runs, but were ninth in stolen bases, played leaky defense, and had poor relief pitching. Hitchcock announced his retirement after the 1967 season. In winters he had helped in his father-in-law’s hardware store in Opelika. Now he would run the store, but his retirement from baseball proved short-lived. When John McHale moved from the Braves to the expansion Expos in 1969, he persuaded Hitchcock to serve as special assignment scout and then director of minor league instruction for Montreal. Hitchcock continued to live in Opelika. His first wife died in 1973, and in 1976 he married Bette Ann Miller of Opelika, a widow with five children. He played slow-pitch softball until he was 60, but his major retirement avocation has been golf, a sport he has enjoyed throughout his adult life. He combined his love of golf with his commitment to bettering his alma mater by establishing Auburn’s Billy Hitchcock Golf Tournament, which has become a premier collegiate golf event. Auburn has returned his loyalty by naming its renovated baseball field Hitchcock Field. In 2003 Baseball America named this 4,090-seat facility the best college stadium in the country. Devaney, John, “A Study of Player Discontent,” Sport, February 1967, p. 18. Greene, Sam, “Billy Hitchcock: Hardwareman to Tool Up the Orioles,” Baseball Digest, February 1962, pp. 63-65. Hitchcock File in the A Bartlett Giamatti Research Library at the Hall of Fame contains dozens of clippings from The Sporting News between 1939 and 1980.